And now, we give praise to Jim Henson, patron saint of puppeteers. That is, if Jim Henson were Roman Catholic. Again, this film was from the golden age of pre-digital special effects. Everything here was old school, except for the computer-animated owl in the opening sequence. I've been told that that was the first attempt at creating photo-realistic digital creatures for full-length films. Jim Henson's creature workshop must be a great place for a grade school field trip, especially if you grew up knowing Jim Henson's name. Young kids right now will probably never know how much that man contributed to the art of cinema. The characters in this film will all go down as classic, especially Hoggle. Which is why for me, first-class animatronics is better than first-class CGI. You can really tell the difference. Thanks to the brilliant muppeteers Dave Goelz, Steve Whitmire, Kevin Clash, and Frank Oz (all legends in their field), and to the excellent creature designs of the great Ron Mueck. Jennifer Connelly is a pretty good actor, by the way. Well, she was only sixteen when this came out. And she was my first Hollywood crush. But her costume here in this movie---it's so eighties. But of course. This was 1986. And finally, the great David Bowie. The soundtrack played a big role in the film's success. Well, it's Bowie. 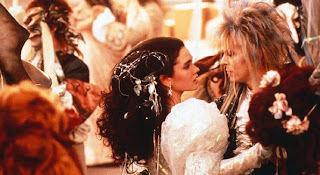 His portrayal of Jareth the Goblin King is not one of his best acting gigs, but it's pretty entertaining, and it's not half as bad as the critics say. Bowie is Bowie. I believe he's the only one who could've pulled off that hair. But Bowie's crotch is another story. Pretty distracting, if you ask me. Bowie's hair: Eight out of ten. Bowie's crotch: Three out of ten. the tally is most amusing. ^true the bowie bulge hahaha!